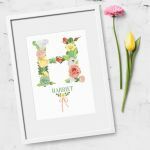 These beautifully feminine and romantic prints feature your initial recreated using stunning watercolour flower graphics. 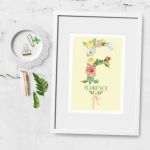 The flower illustrations were hand painted using watercolours and soft coloured pencils, and the artwork is printed on high quality textured watercolour paper. 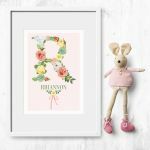 In pretty sorbet pastels, the prints are available in a choice of colours and will look delightful on a bedroom wall or in a newborn's nursery. 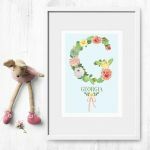 A beautiful personalised print for all ages, and a pretty gift for her. The overall size of the mount is 10"x8" and will fit into any standard 10"x8" picture frame. 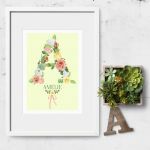 The overall size of the mount is A3 (420x297mm) and will fit into any standard A3 picture frame. Delivery: Your print will be posted flat in a large strong hard backed envelope. The 10x8" size print is posted via Royal Mail Recorded Delivery (delivery time approximately 1-3 working days). The A3 print size is dispatched via courier (approximately 2-5 working days).